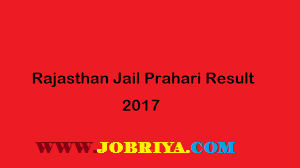 Latest Updated On 11.02.2019 : Rajasthan Jail Prahari Has Released Final Result & Final Cut Off After Physical………………Check Your Result Through Region Wise Through The Link Given Below……….. The Rajasthan Prisons Department serves the State by keeping in safe custody the persons forwarded to prisons of state. The prisoners are kept in safe, humane, cost-efficient, and adequately secure and supervised environment of prisons and provide work and other self-improvement opportunities to assist offenders in becoming law-abiding citizens. Rajasthan Prison Department had invited Online Application for the Recruitment of 925 posts of Warder/ Jail Prahari. The Process of Submitting Application was Online and Candidates Submitted them till 02.12.2015. Here the Candidates can Check the Recruitment Details from the Below Link. Rajasthan Prisons Department has organized Written Exam for Posts of Jail Prahari. Exam was organized for TSP Area & Non TSP Area. So Candidates from All Over Rajasthan took part in the Exam. The Re – Exam was Scheduled on 26 August to 14 September, 2017. Selected Candidates Was Called for the Written Exam. The Written Exam was Conducted on the Date 20 to 30 October, 2018. The written test was multiple choice objective type. There was a composite paper carrying 400 marks. 04 marks was awarded for right answer and 01 mark was deducted for wrong answer. The time duration of Test was 02:00 hours (120 minutes). Result for the above said Rajasthan Jail Prahari Exam will be announced & Declared on its Official website. Candidates will also be intimated about Next Process on their Registered ID & Mobile No. Cut Off Marks for Forest Guard & Forester Online Exam will be purely based on No. of Vacancies, Total No. of Candidates & Level of Questions Papers after Normalization. Cut Off Marks will be announced from out of 400 Marks. There will be no sectional cut off for these Posts. Shortlisted Candidates of Written Exam will be called up for Interview & Physical Test. Interview will play main Role in Deciding Fate of Candidates. Candidates need to work hard to get good marks in Interview Process.